Jamal Mubarak - Who is Jamal Mubarak? 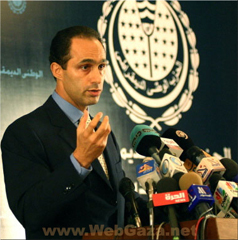 Jamal Mubarak, the 47-year-old son of President Hosni Mubarak, is the head of the National Democratic Party's Policies Committee. He joined the NDP in 2000 and quickly rose to a position in the party's General Secretariat. Jamal's role within the party is particularly influential because the NDP policies committee serves as a platform that increasingly shapes government policies. He has been a leading advocate of economic reforms and has been instrumental in cabinet appointments of technocratic ministers since 2004. Jamal Mubarak is a well-established member of Egypt's business elite, an anomaly for a potential successor to Egypt's 48-year legacy of military rule. An investment banker and financial consultant by profession, Jamal Mubarak served as an executive in London for Bank of America International from 1988 to 1994. Although there is much discussion in Egypt over the prospect of Jamal's possible succession to the presidency, he lacks popular appeal and his constituency is limited to business communities and the upper-middle class that supports his neo-liberal economic agenda and secular, modernist outlook. Jamal's path to succession could also be obstructed by the need to secure the full endorsement of both the military and the NDP's old guard. Since 2004, speculation that Jamal is being groomed for presidential office prompted the emergence of various opposition groups and campaigns to mobilize public opinion against Jamal Mubarak, most notably Kefaya, or the Egyptian Movement for Change. These anti-Jamal campaigns continue to fuel the opposition today, as evidenced by the platforms and demands of groups like the National Association for Change and the April 6 Youth movement. In recent months, Jamal's supporters have attempted to counter these efforts by launching pro-Jamal campaigns such as the Popular Coalition for Supporting Jamal Mubarak, which have been disseminating posters and gathering signatures in an attempt to boost the candidate's popularity and legitimacy.